In addition to offering habitat to fish, artificial reefs improve fishing opportunities and create new scuba diving destinations. Florida is responding to fisheries depletion and habitat degradation with one of the nation’s most progressive artificial reef programs, deploying up to 100 public artificial reefs each year. For more than three decades, Florida Sea Grant has played a leadership role in the evolution of the state’s artificial reef program. 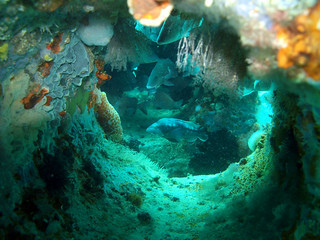 This includes co-organizing, in coordination with the Florida Fish and Wildlife Conservation Commission regional artificial reef workshops as well as the the statewide Artificial Reef Summit, a conference held approximately every 4 to 6 years to bring together program coordinators, fishery managers, scientists and constituency groups. Florida Sea Grant and the Florida Fish and Wildlife Conservation Commission hold periodic regional workshops as well a statewide Artificial Reef Summit, which is held every 4-6 years. Visit our artificial reef Workshops and Summits page to see upcoming workshops, as well as archived video presentations from past workshops and summits. Artificial reef projects around the state have been transformed by a combination of ecological expertise, engineering, and design informed by scientific data. A team of science communicators from University of Florida News recently traveled to Florida’s Panhandle to spend time with Florida Sea Grant agents Laura Tiu and Scott Jackson to find out more about diving and snorkeling reefs. Enjoy this luscious underwater experience. Florida Sea Grant’s long-term research, funded by state and federal partners, continues on a vast network of one-ton concrete reef blocks deployed in the northeast Gulf of Mexico. The research is testing how reefs can enhance habitat for gag grouper and other targeted fish species. Read more.